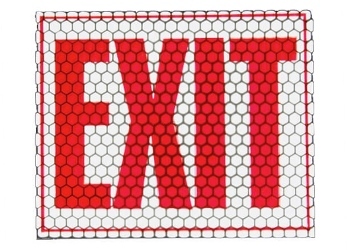 Cyflect Adhesive Glow in the Dark Exit Sign is an industrial grade photo luminescent exit sign for egress marking can be seen visible through fog, smoke or wet conditions. The Cyalume Emergency Glow-in-the-Dark exit sign brings light to dark places, marking a bright path to safety without the need for batteries or power. Visible from any angle, this adhesive emergency sign is an evacuation planning must have!